Rylee Phillips learned the hard way that you need to live each day to the fullest. That’s why she came back home to turn the inheritance of her aunt’s old homestead into a bed & breakfast. The townsfolk think she’s crazy to take on the task, and maybe she is, but at least she’s smart enough to know she needs help...and the clever ad she places in the local paper is sure to get attention. A devastating loss has left Wyatt Grayson lost. Selling his business, he takes off cross country to see if he can outrun the nightmares and find…something. When an amusing ad for skills he hasn't put to use in a long time catches his eye, he jumps at the unexpected opportunity. He plans to work for a few weeks, keeping his hands busy and biding his time; what he doesn’t expect is his new boss showing him how to live again. Rylee Phillips is back home in Timber Creek, Texas. Once she found out she inherited her Aunt Thelma’s home. It was the sign she needed. She had been homesick especially after the breakup with her ex-Brian. She needed control back in her life and coming home to claim her new home was it. She is going to turn it into a B & B (Bed & Breakfast.) Everyone thinks she’s as crazy as the aunt that gave her the house. But she has a dream and she would do anything to make it work. Her first step is she needed help but she had none. She needed someone who was handy with tools, she had none. 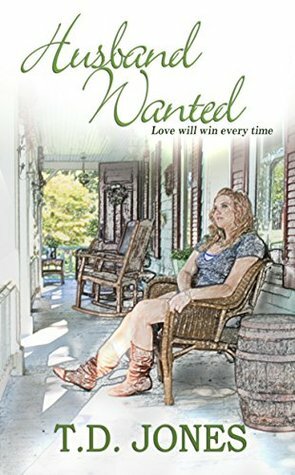 So, she took out a “Husband wanted ad.” Her brother the sheriff was not happy about it at all. He about had a heart attack. Tried to tell her how dangerous it could be for a woman to put an add out like that. But she didn’t care she knew it would work. It just had too. Luckily, it did. Only one person applied. He seemed to know what he was talking about. So, she hired him on the spot. Really two things made the choice for her. One the neighbor next door has been bugging to buy the ranch first from her aunt and now her. She said, No just like her aunt. Two, no one else had applied. So, by default, he got the job. Not only that he was handsome too. But the great smile and laughter he gave off didn’t reach his eyes. For there was a sadness of some kind that he was hiding. But weren’t they all including her. You see eight years ago her life was very different. She lived through the worst experience of her life. Cancer. For just that moment when she heard the doctor say that word, her world stopped moving. The room faded away except for her and her doctor as he told her she had it. Yet, light years later she’s living life now wide open. The last four years after a breakup. The man couldn’t love all of her. So, she walked away at a time when her aunt said in her will I give you my farm and a bit of money. Now her dream is a B & B. So, the morning arrived to hire someone and only one person arrived. It happened to be the man who has a chest made of bricks that her short stature runs into as she’s fleeing her home for her life. You see, she and the stray she named “Cat” to not get to attached. They heard a noise coming from the fireplace as they bent down to investigate something came flying out at her and was chasing her. As she runs out screaming into the arms of Wyatt Grayson. He asks if she would like him to investigate she nods but can’t seem to move out of fear. He picks her up and sets her down out of the way. She’s so small she’s as lite as air. When he returns, he is holding the culprit. It turns out to be a baby owl who is now injured after running into a lamp. She hires him and says she’ll be back that she needs to take the owl to her sister-in-law at the vet’s office. He says he’ll drive so they can talk about the job. She feels nothing but good vibes about him but finds it odd he’s not so concerned about his pay. He right away likes Rylee and for the first time in two years, he finds himself laughing to himself since his wife died of cancer. Especially, as he hears her recount her experience of the killer baby owl. This was a cute story of a lost love, sorrowful loss, love, pain, and healing. Yet, one of hope, strength, and a fight for survival. How we can’t always handle out fears alone sometimes we need love to guide us. I give this: 5 stars. Provided by netgalley.com. Follow us at www.1rad-readerreviews.com.